A war drama set during the Nazi invasion of the Soviet Union in June 1941, in which Soviet troops held on to a border stronghold for nine days. A story of Lyudmila Pavlichenko, the most successful female sniper in history. During WW2 the Russian Army sent a special group named "Zvezda" to fight the Nazis in their backyard. Young Soviet Army recruits are stuck in the bloody war in Afghanistan, that was started by politicians. 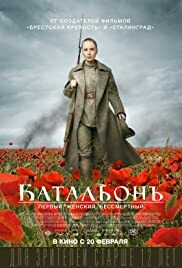 A group of Russian soldiers fight to hold a strategic building in their devastated city against a ruthless German army, and in the process become deeply connected to two Russian women who have been living there. February 1917 revolution has affected mode of life in Russia and changed the course of Great War. Monarch has abdicated. In trenches, were the confrontation with Germans lasts for several years, Bolsheviks are very active with their propaganda. They call for making peace with enemy. Russian officers can actually do nothing without approval of so-called Soldiers Committees. The army is just near the stage of complete degradation. By order of Russian Provisional Government, attempting to strengthen the spirit, the female Death Battalion is established. In charge of the Battalion - Cavalier of St. George Maria Bochkareva. Death Battalion give the lead of courage, fortitude and composure, stiffen the spirit of soldiers and prove, that each of the female hero is worthy of the Warrior Title. Russia had already lost the war, and carrying on with it was pointless. Does show how gruesome the war was, but fails to question the need to fight it. Enemy soldiers in uniform are entitled to collect military intelligence and are not spies. To ignore a white flag is a war crime. Maria Bochkareva got pardoned once, but urged US intervention to help the far-right and antisemitic Whites in Russia's Civil War. Saying she was 'seen as on the White side' is not a fair summation of this. Came back to fight as part of their army, was captured and executed.